2-minute stories on "vintage" phones. 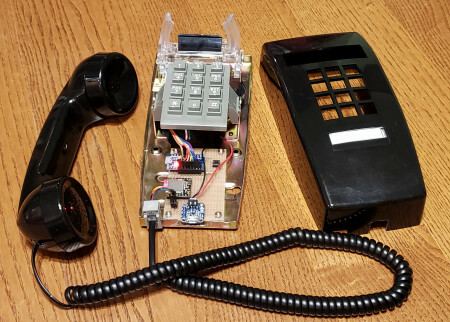 2-minute story phone using a microcontroller and a self contained MP3 player with SD card reader. As part of our next expo, we need a story telling device. The suggestion came up to utilize vintage phones, where a visitor would press a key, and listen to a 2-minute story, associated to a key number. I was given a pseudo vintage phone, and immediately started to gut it. Took note of the keypad matrix configuration, and rewired it, as well as the hook switch and handset. On a breadboard, I hooked up a 3.3V Arduino Pro Micro Chinese clone (I had a few laying around), a DFRobot MP3 player, and a lipo battery with an Adafruit charging unit. I had a feeling that phone placement and access to power outlets would be an issue, so I went ahead and made the unit self contained with a 2000mA/H lipo battery. I then proceeded to write quick code to show off the possibilities of the device. I added the option for volume control on the * and # keys, and a pause feature via the 0 key. When the phone is picked up, a 2-second dial tone is played, immediately followed by short instructions. I also recorded 9 placeholder stories, with my particular "dad jokes" humor. When I showed the prototype, they were impressed. Well, for us makers, it's easy breezy stuff. But it's always nice to see the awe from others. It warms the heart! Next step? Receive a bunch of varied vintage phones and reproduce the prototype, and refine the process. Hopefully, I'll get some with rotary dial phones. This will be new for me, as I never dealt with those. But I'm eager to see how I'll interface them. Though I'm sure it won't be much of an issue. I'll document the process and keep you posted. And sorry for the lack of pictures for the prototyping stages, i never think of photo-documenting my stuff. VR Technology Specialist by day, maker by night (and weekends).